CarGurus has 7,634 nationwide Yaris listings starting at $1,977. Though a pleasant enough commuter car, the 2016 Toyota Yaris subcompact hatchback remains distinctive for its notable lack of distinction in this competitive niche. All of which is not to say that the 5-passenger, 3- or 5-door Yaris is not without its merits, especially after the comprehensive redesign it received for the 2015 model year. The 2016 Yaris comes in 3 trims: the base L, the midlevel LE, and the flagship SE. A number of reviewers remain impressed with this hatchback’s better-than-average rear-seat room, though less so with its cargo space, a mere 15.6 cubic feet behind the rear seats (the 60/40 rear seats do fold down for additional space, but Toyota has not specified how much). The only upgrades worth noting for the 2016 model year include a couple of new exterior color choices, Barcelona Red and Crushed Ice, along with a new driver-side knee airbag. A 1.5-liter inline 4-cylinder engine powers the 2016 Yaris lineup; a 5-speed manual transmission is standard on the 3-door L and the 5-door SE, and a 4-speed automatic comes standard on the LE and the 5-door L. Look for 106 hp and 103 lb-ft of torque from the I4, with mileage estimated at 30 mpg city/37 highway/33 combined with the manual transmission and 30/36/32 with the automatic. The 4-speed automatic is also optional for the 3-door L and 5-door SE. Standard features aboard the base Yaris L for 2016 include 15-inch steel wheels, cloth upholstery, power door locks and windows, a tilt-only steering wheel, air conditioning, and Bluetooth hands-free calling. All 2016 Yaris trims also feature a CD/MP3 player with 6 speakers, HD Radio, an auxiliary audio input, and a 6.1-inch dashboard-mounted display. The midlevel Yaris LE adds 15-inch alloy wheels, power-adjustable outside mirrors, keyless entry, cruise control, upgraded cabin accents, and steering-wheel-mounted audio controls. And the Yaris SE throws in 16-inch alloy wheels with upgraded tires, a rear spoiler, and a sport-tuned suspension. Enhanced exterior styling elements and cabin accents are also standard on the SE, along with premium cloth upholstery and a leather-trimmed steering wheel and shift knob. GPS navigation is available on all trims as a dealer-installed accessory. Standard 4-wheel antilock brakes are featured on all 2016 Yaris variants as part of Toyota’s Star Safety System--the L and LE sport front disc and rear drum brakes and the SE packs 4-wheel disc brakes. Further safety items include traction and stability control, front side-mounted airbags, front and rear head-protection airbags, and daytime running lights. The SE also comes with standard front fog/driving lights and LED running lights. Toyoguard roadside assistance and emergency services are optional across the lineup. The current Yaris scored 4 out of 5 stars overall in National Highway Traffic Safety Administration tests, while the Insurance Institute for Highway Safety awarded the Yaris a top score of Good in all tests except for the newly instituted small-overlap frontal-offset, on which this subcompact hatchback received a next-to-worst score of Marginal. Again challenging the Yaris in the 2016 race for subcompact supremacy are such perennial rivals as Honda’s Fit, Ford’s Fiesta, Kia’s Rio, and Nissan’s Versa. 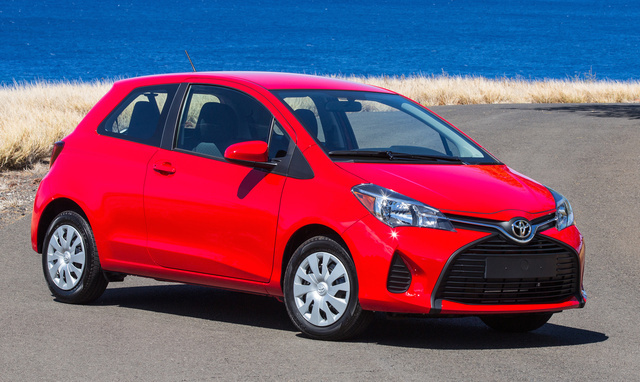 What's your take on the 2016 Toyota Yaris? Users ranked 2016 Toyota Yaris against other cars which they drove/owned. Each ranking was based on 9 categories. Here is the summary of top rankings. Have you driven a 2016 Toyota Yaris?